Nationally, a relentless inventory shortage, a booming stock market, and attractive interest rates fueled strong home buying demand. Despite a noisy political climate, unemployment fell to 4.1% a17-year low, and single-family home sales rose 5.6%, to an 11-year high. In South Santa Barbara County, housing supply remained limited: the number of new listings fell 10% to 2,265. The number of sales rose 4% to 1,759, as did the number of pending listings, which inched up 1% to 1,729. Both average and median sales price climbed 6% (to $1,423,289 and $997,000 respectively). Sold volume grew 11% to slightly over $2.5 billion in sales. 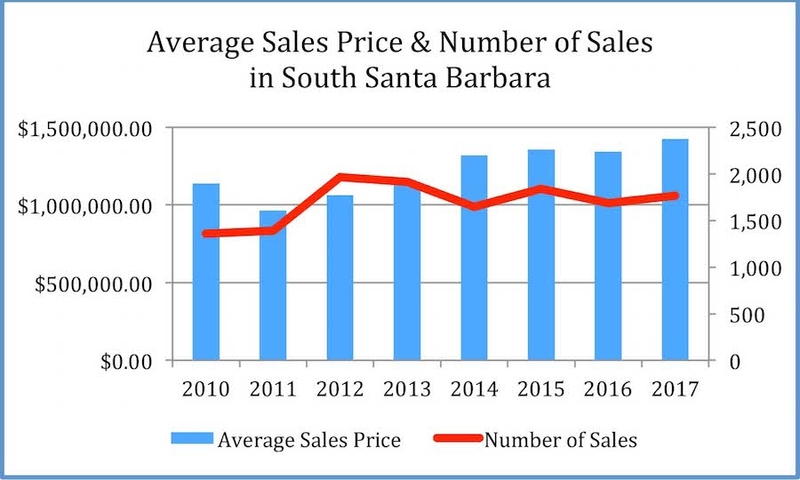 On average, South Santa Barbara County properties sold at 95% of their asking price, 1% less than last year. Homes had a slightly longer shelf life: cumulative days on the market averaged 51 days, up from 33 days in 2016. The high-end outperformed last year, with 9 sales above $10 million, compared to 6 sales the previous year. 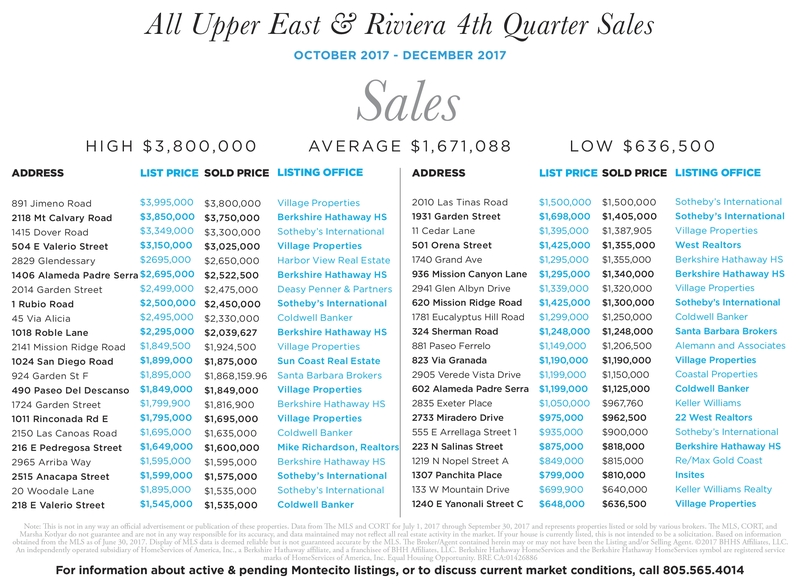 The Montecito luxury real estate market faced some challenges in 2017, with an uncertain political climate and the largest fire in California history. Not surprisingly, 4th quarter experienced a dramatic reduction in both inventory (falling 22%) and sales (sinking 19%). Looking at 2017 as a whole, housing supply fell 5%, to 367 new listings, yet the number of sales was unchanged. 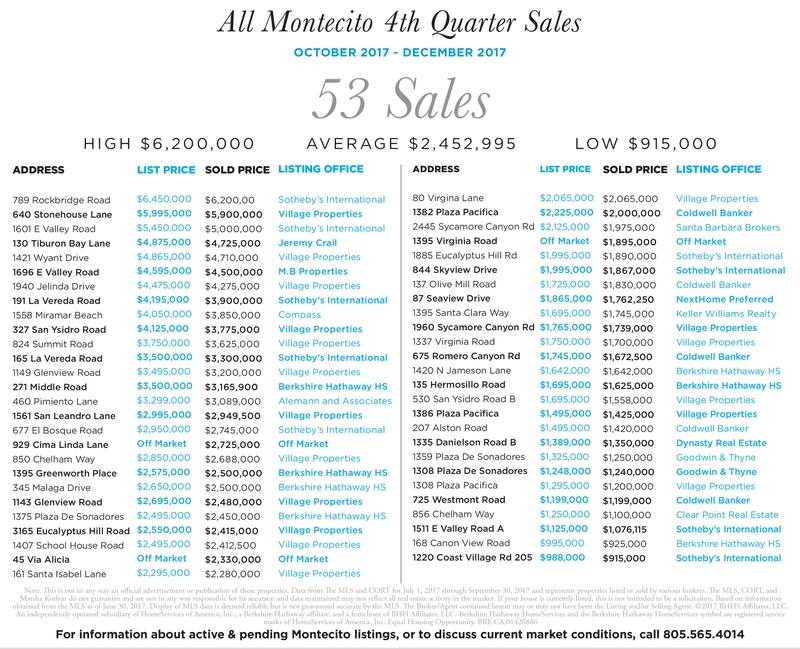 Montecito was the only district where sold volume declined, down 4% to $671,186,245, attributed in part to a tepid luxury market, with only 3 sales above $10 million in 2017, compared to 6 sales in 2016. Although the median sales price grew 8% to $2,767,500, average sales price dipped 3% to $3,226,857. On average, listings in Montecito sold at 93% of their asking price, the same as the previous year. 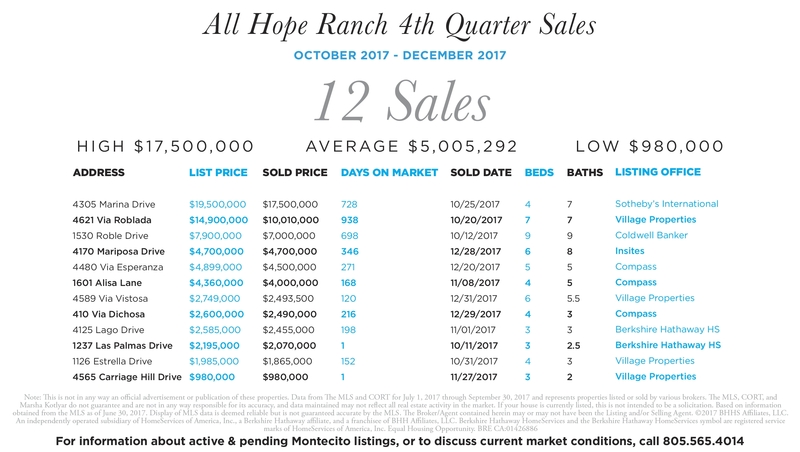 Unlike Montecito, the 2017 Hope Ranch market finished the year strong. Compared to 2016, inventory fell 7%, while the number of sales shot up 52% to 32 closed transactions. Sold volume spiked 68% to $117,987,200 and the number of pending listings also grew, 4% to 27 transactions. While the average price rose 11% to $3,687,100, the median price fell 9% to $2,600,000. On average, listings in Hope Ranch sold at 90% of their asking price, down from 93% last year. Of the sales, time on the market was substantially higher in 2017, averaging 173 days, from 55 in 2016. Some economists predict that 2018 may be the last year U.S. housing markets could see price growth. On the finance side, borrowers can expect to see the historically low interest rates gradually grow to an average of 4.5% over the next 12 months. With the recent fire and mudslides, the local housing inventory will be in extra short supply, which could cause prices to spike. There will be strong demand for turnkey homes as well as investor-driven opportunities. My team and I look forward to helping meet this demand by substantially increasing our marketing and advertising efforts during a time when others are cutting back. By the end of 2017, we had 25 closed and pending sales, totaling over $82 million. If you are interested in selling your property, please call 805-565-4014. All calls will be confidential. We would like to acknowledge the recent events our town has endured thank everyone dedicating countless hours toward restoring peace, as well as offer our deepest condolences to those suffering losses. Despite many of the videos and photos you’ve seen on the news, the majority of Montecito’s natural beauty remains in tact. 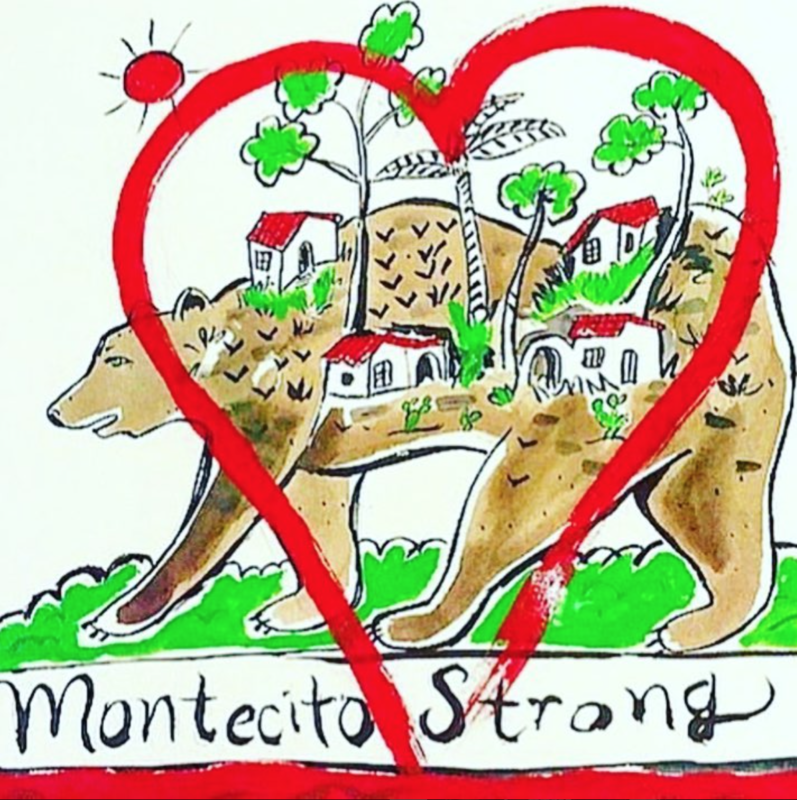 With about 4,100 residences in Montecito, approximately 90% of the homes were not damaged or destroyed during the recent Thomas fire and mud and debris flow. We believe the majority can be and will be rebuilt. Although we are deeply saddened by the devastating events, the culture and community has never been stronger and we share in the collective commitment to rebuild our wonderful town we all so love and thrive in. Montecito residents can chose to live anywhere in the world and they will still chose to live here.